In search of decorative wedding cake ideas? Fresh flowers are a popular choice for wedding cake décor. You can add a natural vibe with seasonal color and texture. The rich colors of autumn make an especially beautiful backdrop. Working with a cake baker and florist? Ask your baker for a photo or diagram of the cake you have selected. This helps your florist calculate the volume and price of the flowers needed to decorate the cake. 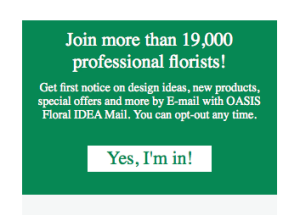 Have your florist and cake baker exchange contact information. As a precaution, ask specifically for cell phone numbers in case of a cake emergency. Ask them to schedule in advance a meeting for on site floral decorating of the cake or agree on a plan for how cake decorations will be added. One decorating technique that works well is to have the cake baker place mounds of icing in the areas where the flowers stems will be inserted. The icing acts as the design mechanic that holds the flowers in place. The stems won’t touch the edible parts of the cake. Prior to cutting and serving the cake, a cake server can be used to remove the flowers and icing to a plate nearby. Add highlights of seasonal color and texture with surprising decorative accessories. Wire and rattan are eye-catching elements that are fun to experiment with OASISFlat Wire and OASIS Midollino Sticks are two great products that are easy to design with when accessorizing cakes. They can also be easily removed when it’s time to cut the cake. The florist can mark the spots for the placement of icing mounds on the cake diagram. 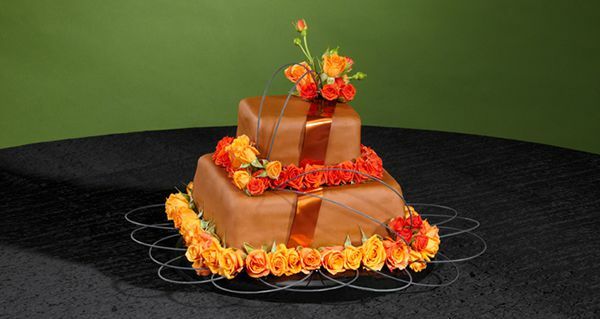 The cake baker and florist can meet on-site to install and decorate the cake together. The baker can leave a tube of icing for the florist to place the mounds as they design. Special consideration must be given when placing cakes outdoors or in extreme hot or cold areas. Check the cake site in advance at the wedding time of day on several occasions. Be sure there isn’t a hot spot there from bright sunlight. Shield the cake from direct sunlight, heat, wind and rain. Make sure the table supporting the cake has a firm foundation and won’t turn over. Create a plan for keeping insects and house pets away from your wedding cake. 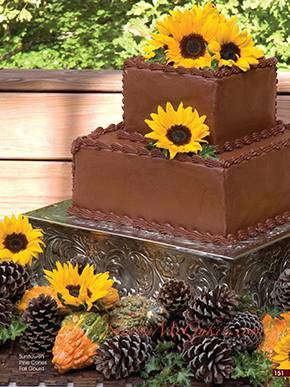 Have an alternative plan for moving the cake indoors in the event of inclement weather. Place needed serving items such as utility table, serving utensils, plates, etc. out of the cake display sightline but within reach for easy serving. Flowers of the season are more accustomed to seasonal outdoor temperatures than hothouse flowers of another season. 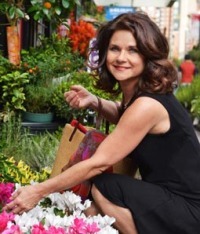 You may save money using readily seasonal flowers versus out-of-season flowers shipped from another climate. As a bonus, seasonal flower colors are typically more complimentary to the season’s wedding fashion colors as well. Floral design questions? Let us know. We can help you find solutions. Want more tips like these delivered to your email inbox?